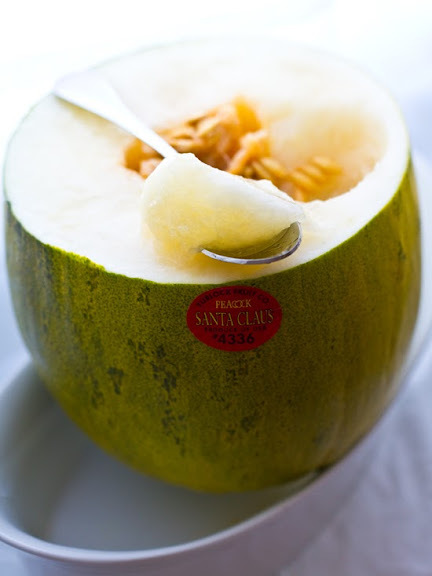 Breakfast Melon. Have your Bowl and Eat it too. 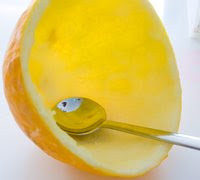 ..sometimes you don't even need to take the time to chop you melon! Here's how.. It's dawn. A gold sun is creeps up towards a hazy blue sky. It's Saturday. You yawn. You're parched. You're blissfully groggy. You are still in your pajamas and would like to stay that way for a while. Good. Something to eat. Tired eyes don't focus well on stoves. Toasters do that overly-energetic pop-up thing. And a hot cup of caffeine might wake you too soon from your relaxed, half-awake state. What to do? 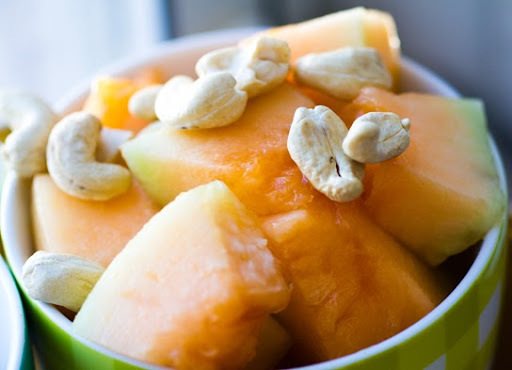 Have Your Melon Bowl and Eat it Too. There is something cozy and comforting about grabbing a big bowl, a spoon and diving in. Especially in the morning. Preferably on a weekend. Most people fill their bowl with Saturday morning cold cereal, cozy hot oatmeal, grits or cream of wheat. And on that rare occasion, some mint chocolate chip ice cream. Hey, I was a kid once too. But I didn't do that. Not me. Nope. But now as a health-driven, wellness-seeking adult, I've discovered a bowl that is strangely satisfying, healthy, hydrating and energizing. A big bowl full of melon! And the best part: no dishes required. The bowl is built in, straight from Mother Nature's kitchen cabinet. 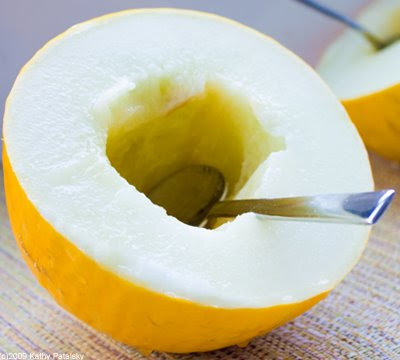 Canary Melon. 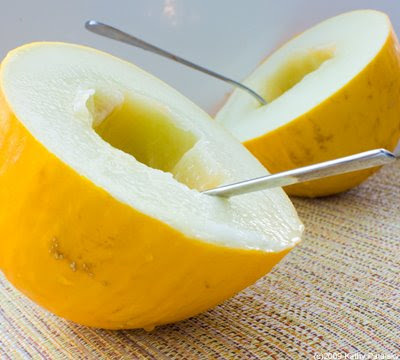 This morning I ate a big bowl (half a melon) of a Canary Melon. Named after the Canary Islands, and also ironically the color of a canary bird. It was divine. Sweet, juicy, melted in my mouth. Much better than a bowl full of O shaped oats. And the other day I had a cantaloupe bowl. And a few days before that (four in a row) I was hooked on my Papaya bowl. Not a circular bowl, but my only requirements: all you need is a spoon. 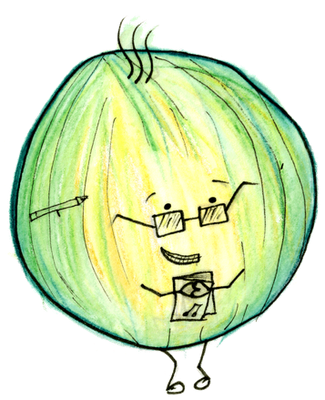 Canary Melon Facts. 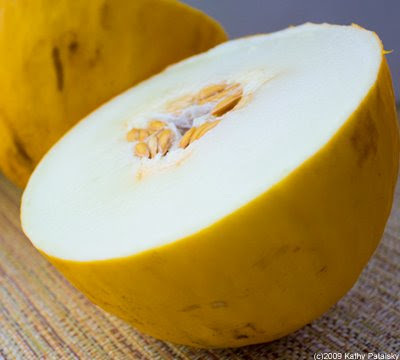 The Canary Melon is sweet and juicy with a hard smooth yellow rind. It has around 48-60 calories per cup of cubes. I'd estimate my melon bowl was around 90-130 calories. Most melons are good sources of Vitamin C, fiber, potassium and Vitamin A. Melons are around 90-95% water, so are incredibly hydrating. I like my melon bowls chilled in the fridge before eating. Melon Nutrition. 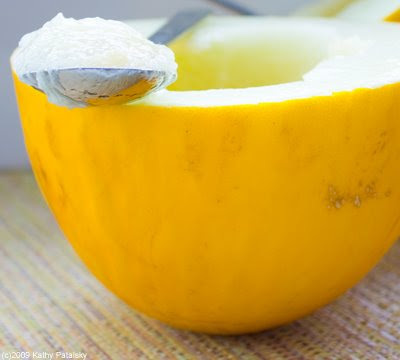 Melons (and papayas) are perfect morning eats. 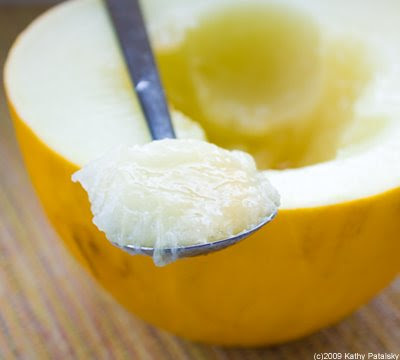 It is widely known that melons are one of the most quickly digestible foods. By the time they hit your stomach, they are pretty much digested. Thus, for adequate food combining, it is recommended that you eat melon's on their own-on an empty stomach. Perfect constraints for morning time. And melons are incredibly hydrating. Another factor that makes them perfect for first thing in the morning. You can always grab your cup of tea or coffee a few hours after your melon, but first thing in the morning, why not get hydrated the way Mother Nature intended. With fruit! Other Melons. 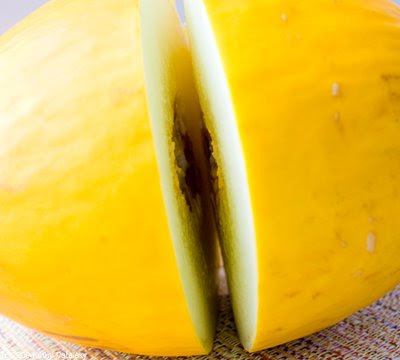 There are so many types of melons on the market today. Just the other day in Whole Foods I counted eight different varieties available for purchase. There was Canary, Crenshaw, Watermelon, Cantaloupe and a bunch that i had never even heard of, but smelled and sounded delicious! I always tap or thunk my melons, thus the 'sounds delicious' reference.